The most inspired performance in this sea of overacting and long winded performances was by James Spader as a fat WN Bilbo. He and Jackie Earle Haley as Alexander Stephens (the Confederate Vice President) were the closest things to interesting characters in the bunch. Everyone is going on about Sally Field as Mary Todd Lincoln, but it felt like she was trying… very hard to be crazy. Sadly I won’t be surprised if she gets an Oscar nomination and expect the same for the movie itself. Tommy Lee Jones as the self rightious Thaddeus Stevens was insufferable with his drab monologues and stage play delivery. 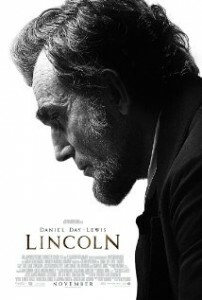 The inherent problem with Lincoln is the story. It’s a great historical event to be sure and as a child I was riveted to learn about it, but making a 149 minute motion picture about a bunch of white men trying to gather votes to amend the law is tedious, predictable and mind numbing. And while the story was unavoidably predictable, the direction was as well, with predictable Spielberg pandering such as close shots of wonderment and another overbearing John Williams score placed in all the “right” places to let us know when we should feel good in case we had dozed off for a moment. I should report that people were crying in the theater all around me by the end and applause broke out when the credits rolled. I did not break out into applause, but instead broke out of the theater rather than watch the credits as I usually do. As I walked to my car I felt guilty for wishfully anticipating our great President’s onscreen death so as to put an end to my in theater boredom induced suffering. I felt free, as free as I had felt in a long time after being cooped up in that dark seated temple for nearly 3 hours. The trees were green, the air was crisp and I truly appreciated my freedom to move where I pleased. As I got on the 101 freeway to travel northbound to work as a freeman, it occurred to me, maybe Spielberg really is a genius. Posted on Monday, November 26th, 2012 at 11:20 pm and is filed under Reviews.